Mass Effect 3 was initially set to release this fall. That date, however, was pushed back to the first quarter of 2012. The reasoning given? BioWare aims to make Mass Effect 3 exceed everyone’s expectations. And part of that process almost certainly comes from creating an even stronger set of combat mechanics. The firefights in the first Mass Effect were a bit lacking, disorganized and repetitive. In Mass Effect 2, the gunplay, squad tactics and cover systems made combat more intuitive, intense and effective. There’s still room for improvement, of course, but the disparity between the combat in the original title and its sequel is massive. 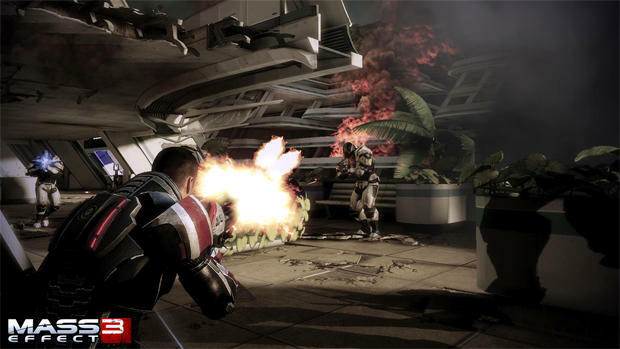 In an interview with PC Gamer, BioWare has elaborated on what will make the combat even more intenese in Mass Effect 3. If you’ve yet to play Mass Effect 2, consider this paragraph a spoiler. Go ahead and skip to the next bit, I’ll be sure to keep the information contained right here. Towards the end of the second title in the trilogy, players learn that they’ll be fighting a much more powerful enemy than they’ve encountered so far: the Reapers. Reapers can take over and mutate the species in the Mass Effect universe. And, according to the interview with PC Gamer, it’s the “Reaper-ised” versions of familiar species that you’ll be fighting in the third game. Imagine an incredible strong, tactically superior, power-possessing Krogan commander. Scary stuff. Mass Effect 3 is due out on the PS3, 360 and PC in early 2012.